By Hassan Sahudin, PE, LEED AP BD+C; Bill Shehane, Seaman Corp., and Alan Strecker, Seaman Corp. 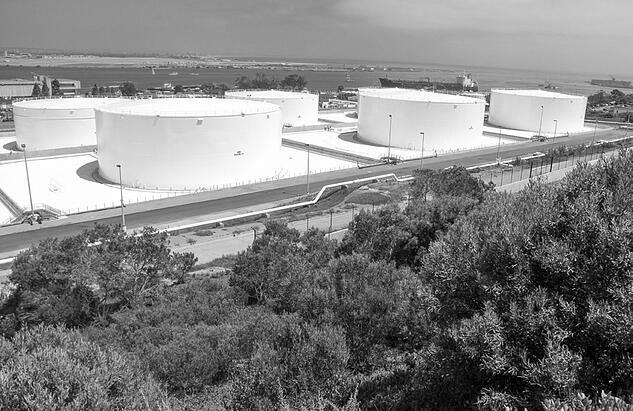 In 2008, an eight-year military construction project (MILCON P-401) was approved to replace the aging Point Loma Navy fuel storage facility originally constructed between 1917 and 1954. Located at Defense Fuel Support Point (DFSP) Point Loma, San Diego, this was the largest construction project ever within the Defense Logistics Agency Energy (DLA Energy) at $174 million. Eight 125,000-barrel aboveground fuel storage tanks were constructed to replace the existing 1 million barrel capacity of jet and diesel fuel storage. A fuel-resistant reinforced polyurethane geomembrane liner was used under each tank and a fuel-resistant reinforced ethylene interpolymer alloy (EIA) geomembrane was used in the dike areas for secondary containment. The project was contracted through NAVFAC Southwest, and Burns & McDonnell provided engineering services. Design began in March 2005 with construction closeout in January 2014. 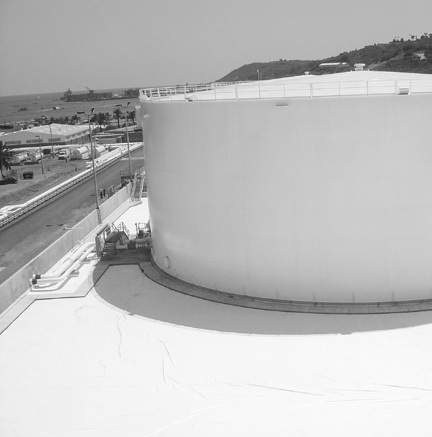 Image 1: Burns & McDonnell helped upgrade the Point Loma Navy fuel storage facility with eight 125,000-barrel aboveground fuel storage tanks. In addition to the U.S. Navy fleet, DFSP Point Loma services a number of other agencies including the U.S. Marine Corps Air Station Miramar, the 11th District of the US Coast Guard/Homeland Security, the National Oceanographic and Atmospheric Administration (NOAA), and Military Sealift Command (MSC). The project upgrades were necessary to modernize existing fuel storage infrastructure with 21st century operation requirements in mind and to maximize sustainable practices. In addition, the project sought accreditation from the U.S. Green Building Council (USGBC) for Leadership in Energy and Environmental Design® (LEED) status. Image 2: Using white tanks and liner help reduce the heat island effect at Point Loma. to prevent further contamination and fuel loss. Initial construction included the demolition, or closure in place, of all existing ASTs and USTs and removal of containment berms. Old material and equipment were used to the extent possible. Located on a hillside, the site underwent major grading modifications to better accommodate the new facility and redirect stormwater, including the construction of new stormwater basins. The site soils were remediated to remove fuel and oil contaminants. Where possible, existing vegetation was left in place and porous surfacing material, such as crushed aggregate, already on site was used as ground cover. Eight new ASTs were installed during construction, each with a storage capacity of 125,000 barrels (Image 2), which primarily store jet fuel (JP-5) and marine diesel fuels (F-76). Other major new structures included a pumphouse, a truck load/unload facility, a lube oil storage and transfer facility, a fuel oil recovery (FOR) facility, which included a 25,000-bbl AST receipt tank and a 10,000-bbl issue tank, and a two-story control tower near the existing fueling pier. With demolition of the existing earthen embankments, new containment structures were needed. Exposed concrete vertical dike walls were used for perimeter enclosure, and flexible membrane liners (FMLs) were selected in lieu of concrete floor for use as secondary containment. FMLs offer a number of advantages over concrete in this application. Lower cost. Typical concrete containments cost $6-$7 per square foot installed (Bausch 2013). FML installed costs are typically $1-$2 per square foot. Rapid installation. FML containment on nearly 12 acres was installed in less than 25% of the time required for concrete floors. Reduced maintenance. FMLs do not require a sealant along the joints/seams to be applied or maintained as concrete does. Repair of FMLs is a simple, inexpensive process that can be done with patches applied by hot air welding or adhesives. 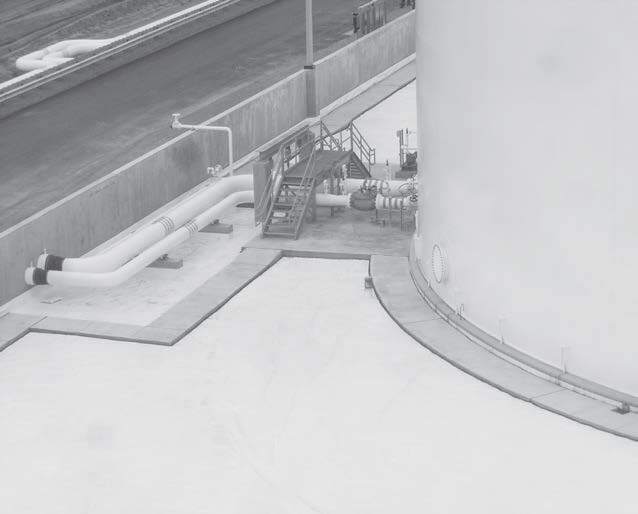 Guidance for the design of secondary containment under fuel storage tanks is provided in UFC 3-460-01. Product selection direction is given in the Naval Facilities Engineering Command’s (NAVFAC) Unified Facilities Guidance Specification (UFGS) Section 33 56 13 15. The UFGS guidelines call for reinforced thermoplastic urethane (rTPU) underneath because of its superior long-term resistance to chemicals, construction damage, a broad range of fuels and oils, and gasoline and volatile organic compounds. The superior abrasion and puncture resistance of rTPUs increases the likelihood that the liner won’t be compromised during construction. More than 142,000 square feet of rTPU, manufactured by Seaman Corp., was used on this project. Image 3: Using a white membrane liner system provides effective secondary containment in the dike areas. large even in comparison to PVC molecules which range in size from 50,000 g/mol to 150,000 g/mol. The solid, dense KEE molecules are stable in the coating which has excellent resistance to chemical and UV action. This results in long-lasting performance of the finished EIA FML. 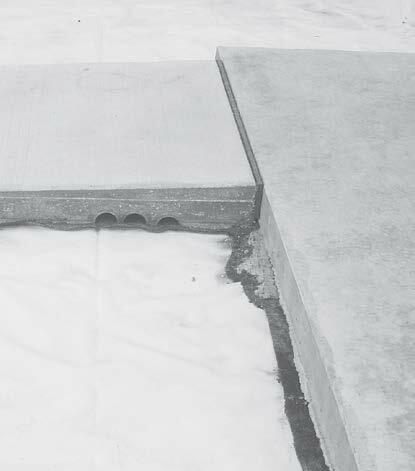 Image 4: Geotextile fabrics placed under concrete sidewalks protect the liner. Because achieving LEED certification was a goal at the Point Loma facility, the decision was made to use a white liner (Image 5), which resulted in lowering the Solar Reflectance Index (SRI) of the liner to below 29 degrees F. This is the maximum allowed by the LEED “Heat Island Effect, Non-Roof” credit requirement. Image 5: The secondary containment area around storage tanks includes vertical concrete dike walls and membrane liner. In addition to being UV resistant, an EIA provided the advantage of having a low coefficient of thermal expansion. This reduces the probability of liner failure due to environmental stress cracking caused by repeated expansion and contraction. It also meant that maintenance personnel would be able to access the facilities without the trip hazard posed by extreme wrinkling that can occur in geomembranes subject to thermal expansion. 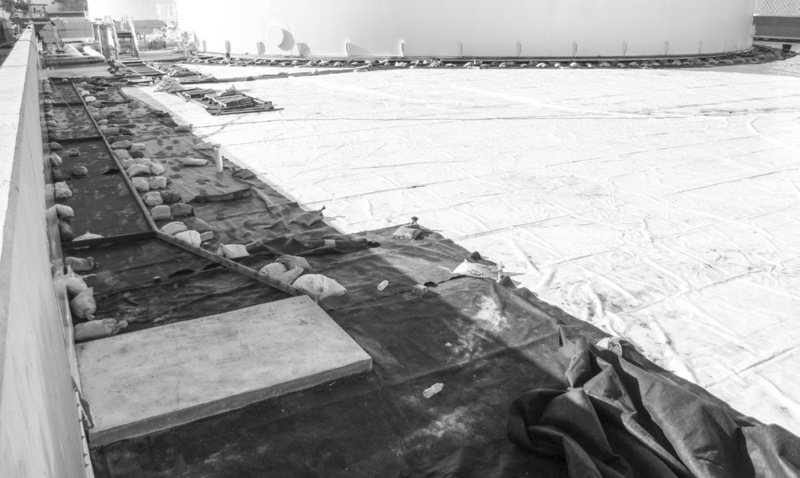 The ability to leave the liner exposed resulted in additional savings in surfacing material and placement costs. In the event of a spill, the containment area would also be easier to clean up without having to remove and remediate the contaminated surfacing materials. Guidance for the design of secondary containment in dike liner areas is also provided in UFC 3-460-01. Product selection direction is given in the UFGS Section 33 56 63. Image 6: Because of potential damage to the liner, traditional steel reinforcing bars and steel from stakes could not be used during construction of concrete sidewalk in the diked containment area. Concrete sidewalks were used to provide access for operations personnel (Images 5 and 6). damage to the liner during operations. Improved working environment in summer months due to reduced heat gain. Bill Shehane is the geomembrane market manager for Seaman Corp. He earned his bachelor’s degree in civil engineering from North Carolina State University. Alan Strecker is the Western geomembrane specialist for Seaman Corp. He earned his bachelor’s degree in chemistry from the University of Colorado Boulder. Hassan Sahudin, PE, LEED AP BD+C,is a structural engineer at Burns & McDonnell and specializes in the structural design of aviation, industrial and military fueling facilities. He earned his bachelor’s degree in civil engineering and master’s in structural engineering from the University of Missouri. SS Credit 7.1: Heat Island Effect, Non-Roof, LEED 2009 for New Construction and Major Renovations, USGBC, Washington, D.C.
To download the original tech brief (pdf), click here. To view additional white papers and case studies, please visit www.xr-technology.com.